An Oklahoma woman says that her 11-year-old grandson shot her in the back of the head. 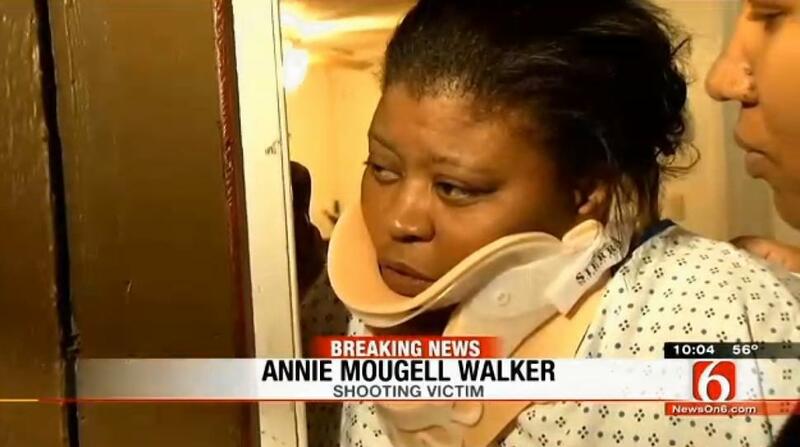 Annie Mougell-Walker, 42, reportedly survived the Monday shooting at her apartment about 4 p.m. in Tulsa and was able to return home later that day in a neck brace — with the bullet still lodged in her head. The boy retrieved a .22-caliber gun from the grandmother’s bedroom while she was reading, Roberson said. The child was charged with shooting with intent to kill, Roberson said. Now Mougell-Walker is trying to comprehend how a minor spat over school erupted into an apparent murder attempt. “He got in trouble today at school, so when I got home I was gonna talk to him furthermore about it,” Mougell-Walker told local station KOTV. “All I saw was a big bang of a flash and heard it, and I knew I was shot in the back of my head,” she said. The grandmother dialed 911 and was taken to Saint Francis hospital where investigators interviewed her. At first the child told police that it wasn’t him. This reportedly prompted police to look for another explanation — until the grandmother spoke out. Neighbors told the CBS affiliate that they were shocked such violence could strike this otherwise peaceful community. “All the kids in the neighborhood play together, so it’s sad, very sad,” Jennifer Franklin said. Doctors were not able to remove the bullet at this time and apparently will have to wait until it works itself out, the victim said. There was small entrance wound beneath the base of her skull, Officer Leland Ashley told The News.